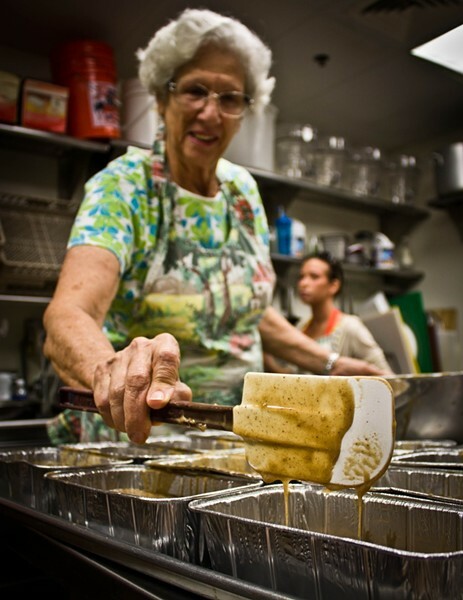 Clockwise from left: Festival co-founder Peggy Harris whisks flour into what will become dozens of honeycakes, volunteer Joe Polizzi mans the oven and co-founder Ellen Byck divvies up the batter that contains "liquid gold" donated by the Savannah Bee Company. 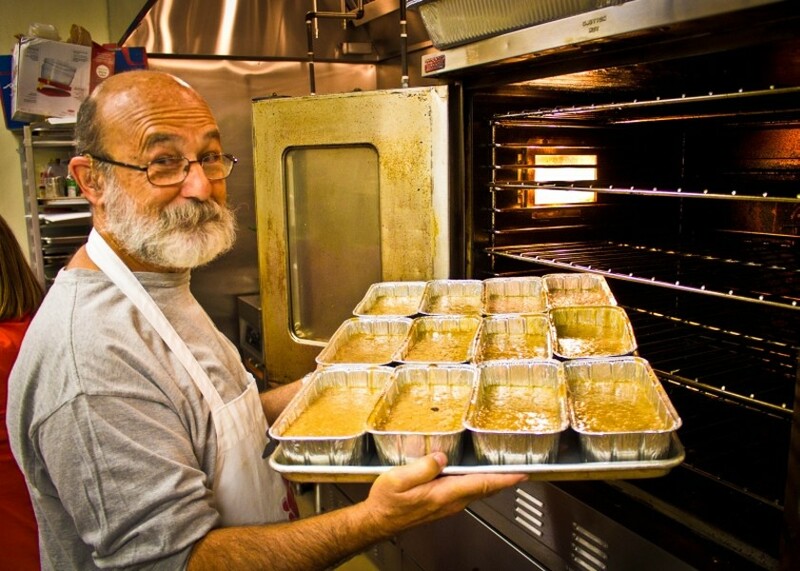 Come October for the past 25 years, the kitchen at Congregation Mickve Israel has erupted into a tzimmes. For those who know their Yiddish, that could mean a mess of traditional European carrot and squash stew dripping from the walls. But it also translates into the less literal definition: A big fuss. 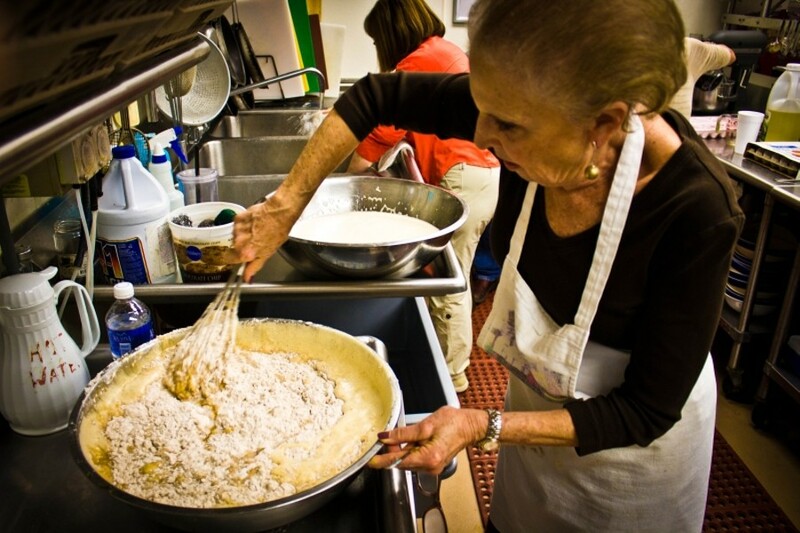 The fervor comes every year as congregants prepare for the Shalom Y'all Jewish Food Festival, a culinary event that attracts appetites from every corner of the city and won a Connect Best of Savannah award last spring. Hundreds of volunteers pull shifts to take turns baking challahs, stuffing cabbage leaves and rolling rugelach in the small space behind the social hall. Their efforts are expected to draw 10,000 people to Forysth Park this Sunday, Oct. 27. 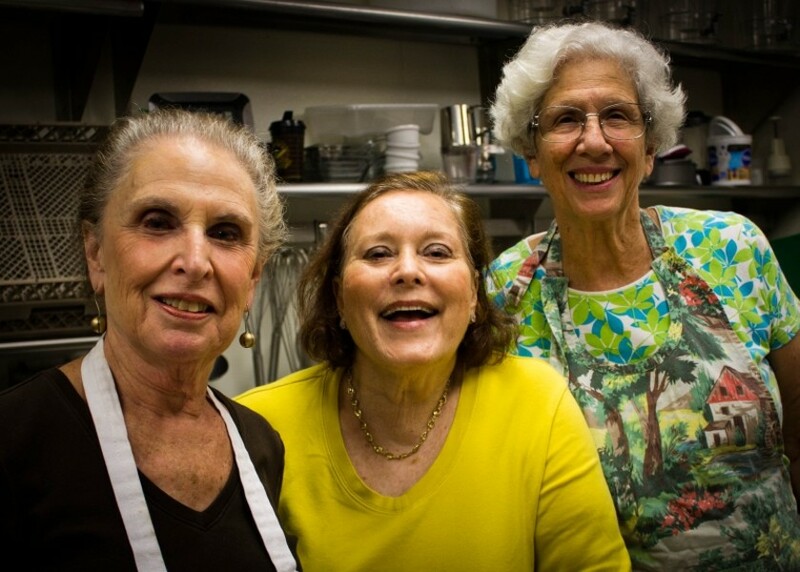 This year Connect caught up with three of the festival's original founders — Peggy Harris, Ellen Byck and Joan Levy — as they busily baked loaves of honeycakes, a traditional sweet treat for Rosh Hashanah, the Jewish New Year that comes in early fall. "Look at this," beckons Levy as she dips a ladle into a bucket of honey from the Savannah Bee Company. "That's five gallons of pure gold!" These women, along with a committed crew of other balabustas (loosely translated as "domestic goddesses"), set up a small tent back in the 1980s across from the historic synagogue in the hopes of raising a few dollars. The event has grown into the congregation's biggest fundraiser as well as a way to collect for the Second Harvest Food Bank and other forms of tzedakeh (charity). "It wasn't always such a big thing — it started out right in Monterey Square," reminds Mickve Israel president Tobi Hollenberg. "There are so many people to thank for taking it from a small festival to the magnificent event that it's become. 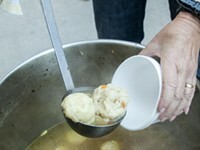 "We're very proud to share the culture of Jewish food with the community." For those who have been cooking together in this kitchen for all these years, the silver anniversary of the food festival (once known as "The Hard Lox Café" until copyright issues arose) is a commendable occasion. "We've been here the whole time!" laughs Byck, stirring raisins into a bowl of batter the size of a bathtub. "Well, not the whole time," corrects Levy, measuring out cups of strong coffee required for the honeycake recipe. "I mean, we don't live back here." Congregation Mickve Israel is no stranger to historic junctures. Founded on July, 11, 1733 by Portuguese Jews by way of England, it is an integral part of Savannah history and the third oldest Jewish congregation in the country. The congregation's 275th anniversary garnered national attention, and its unique blend of Ashkenazic (Eastern European) and Sephardic (Spanish and North African) traditions draws visitors from around the globe to tour the Gothic sanctuary and upstairs museum. Along with the challah, stuffed cabbage, pastries and honeycakes are Old World-style cheese blintzes, chopped liver and corned beef sandwiches (no actual tzimmes, but there's always next year.) Tastes of the Middle Eastern influence are found in the hummus and pita and sizzling lamb. Egg creams and Dr. Brown's soda may be American creations, but they're also part of the Shalom Y'all institution. And of course, there are the latkes — fried potato pancakes served with applesauce and sour cream that often amass a line back to the fountain. "I think the mystique is that incredible smell of them being cooked right there," reasons Harris as she arranges loaf pans. As the spices waft through the kitchen, a rare moment of quiet descends and these matriarchs reminisce over the last quarter of a century, about how Savannah has changed and their grandbabies growing up. They also happily share baking tips with new generations of Shalom Y'all volunteers, like transplant Joe Polizzi and military spouse Joy Schaeffer who are bustling to keep up. Do these balabustas think they'll be around for Shalom Y'all's 50th Jubilee? "I definitely will not," assures Byck. "I might be," considers Levy, whose 96 year-old mother, Mary Mendel, still takes tickets during the festival. Just then longtime volunteer Norm Hirsch pokes his head in the doors and the good-natured bedlam returns. "You guys done yet? We have chicken livers to clean in here!" The honeycake brigade tells Hirsch to come back later after the cakes have cooled. Hirsch gives a mock salute. "I've got a couple of doctors coming to help," he grins. "They're good with organs." When: Sunday, Oct. 27, 11 a.m.-3 p.m.